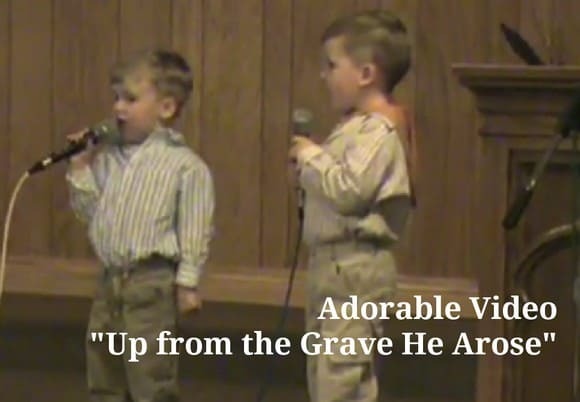 I was looking for Easter hymn “Low in the Grave” or “Up from the Grave He Arose” and found this adorable clip on YouTube. It appears to be a recording of two brothers presenting a music special at a small church. They really sing their hearts out and get most of the words correct. This may be my new favorite version of that classic Easter hymn. I’m pasting the lyrics below so you can follow along. Here’s another version of this classic Easter song from YouTube video. “Low in the grave he lay” – it’s basically required for every English speaking church on Easter morning! It’s the heart of the Christian message & hope celebrated every Spring. Tony Kummer (Editor) reviewed & updated this page on : April 5, 2016 at 10:18 pm. All our content is peer reviewed by our readers, simply leave a comment on any post suggest an update.